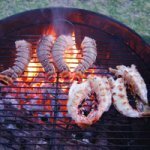 The type of campfire cooking equipment you need depends a lot on what kind of camping you are doing and what kind of things you want to cook. For example, if you are just "camping" at a cabin that you are driving to, you can bring all sorts of equipment, from regular grilling equipment to fancy campfire cooking tools. On the other hand, if you are doing some real, serious, "man versus wild" type camping, just you, a backpack and the outdoors, then the supplies you can bring with you are much more limited. Below, I will discuss some of the types of campfire cooking equipment you may find useful. It includes equipment for cooking on a campfire as well as things you can use to cook alone without a campfire. Campfire Tripod or Spit: A campfire tripod (at right) or spit (at the top of the page above) is an outstanding way to cook over a campfire or fire pit. This classic example of campfire cooking equipment allow you to hang all sorts of campfire cooking tools over the fire. You can hang pots with loop handles to cook stews or soups, you can hang kettles, you can hang trussed whole poultry or leg of lamb to roast on a string, you can even hang a grill grate to grill just about anything. The nice things about the tripods is that most of them disassemble easily and fold up into a relatively small and light package that you could carry with you pretty easily. Campfire Rotisserie: A portable rotisserie is a great way to roast big cuts of meat (whole poultry, leg of lamb, pork and beef roasts, etc.) over an open fire. The one pictured here, sold by SpitJack, folds up nicely into a long sack that can easily be carried around on your back. It has a battery-powered rotisserie motor so you don't have to hand-turn the meat! 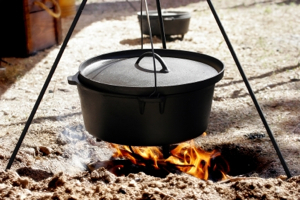 Cast Iron and Long-Handled Skillets and Roasters: There are a number of different types of pots and pans that are suitable for cooking on a campfire. For skillets, find ones with long handles that you can hold over the fire from a distance, so your food is the only thing that gets cooked! Cast iron pots, dutch ovens and such are great because they withstand high heat well and distribute and hold the heat efficiently. Cast iron pots with feet and loop handles are great for either sitting right on top of hot embers or suspending from a tripod over the fire. However, cast iron is heavy and not easy to carry long distances. In that case, lighter weight metal pots and pans may be preferable, although they won't last you as long. Long-Handled Skewers: Skewer cooking is about as easy as campfire cooking can get. Just start a fire, stick some food on the long skewer and hold it over the fire. 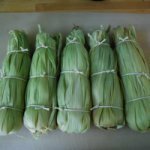 These types of skewer forks are telescoping so they fold up into a small size that you can easily pack with you. This is perfect for smaller cuts of meat like hot dogs, sausages, small game birds and the like. 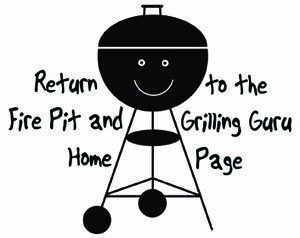 Portable Grills or Burners: There are a number of different types of portable grills and burners that can be taken camping. They vary from larger gas or charcoal grills, that are only portable in the sense that they can easily fit in your car, to truly portable items that either fold up or are just very small to begin with. There are both charcoal and gas varieties, but remember that in addition to the grill itself, you'll have to bring the fuel (charcoal or a tank of propane). Small, portable propane tanks are available. Many simpler campfire cooking tools (utensils, small butane or propane torches or grills, cookware) can be found at most any camping supply shop, like Adventure 16 for example. 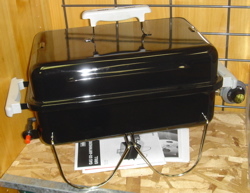 Some barbecue and grill retailers also carry portable grills and the like. However, for more specialized equipment, there are several online retailers you can check out. Lodge carries a huge line of great cast iron cookware and utensils including dutch ovens with legs and hanging handles that are perfect for cooking on an open wood fire, either sitting right on the coals or hanging from a tripod or spit. Cast iron equipment is large and heavy however, so this is only really practical if you are driving and don't have to carry the equipment a long distance on your back. 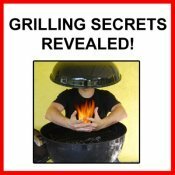 Done with the Campfire Cooking Equipment page? Return to the Campfire Cooking Section.